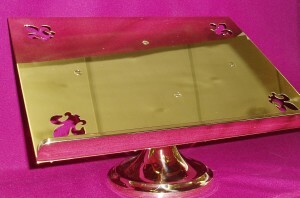 Australian made brass swivel lectern. Made from the highest quality brass, and with outstanding workmanship. Ideal for use on an altar, for con-celebrants. The model in store at present does not have the cutouts shown on the photograph, and measures 35cm in width and 29cm in depth. The lectern has been enamel lacquered to prevent tarnishing.